ZaZaAlerter - windows based tool for ZaZaCHAT Live Help Software - Live Chat for Live Help and Live Support software offered to webmasters. 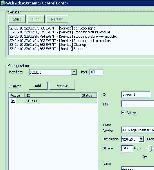 It enables website operators to talk to their web site visitors Live via real time text chat. mioot Live chat software an expert in live chat, live help, live support, Online Free Live chat software offer live customer support for your business. Try FREE Live Chat Software for websites & Call Center to enable live chat service. Free live help software and free live chat support. Cha-cha-chat is a simple livechat widget that lets you sell directly to your online customers. Unlike other live chat software, all you need is a browser to start chatting with unlimited ccustomers. SightMax provides real-time, live chat and live visitor traffic monitoring for your website. VenusValley Live Support enables you to chat live with people visiting your website. Skymol Communicator is a Software-as-a-Service (SaaS) customer service and live chat, live help system using Voice, Video, Text Chat communication forms through your web site. Jerry Messenger is a compact server combination of XMPP/Jabber server and WEB server which allows you to run a Live Chat (Live Help) for your web site(s) on your server as a standalone application. Jerry Messenger is a compact server combination of XMPP/Jabber server and WEB server which allows you to run a Live Chat (Live Help) for your web site(s) on your server as a standalone application. Using Jerry Messenger you and your website visitors may communicate with each other via real-time Chat messaging. miOOt is a visitor tracking and live chat tool, It captures the visitorâ€™s info on a real time basis and provides opportunity to initiate a communication channel with the visitor to your web site. Increase Sales and Decrease your Support Costs. Add LiveSupport.com Live Support Chat to your website in only ten minutes. Start interacting with your website visitors by downloading a Free 14 day trial now. Deliver powerful and feature-rich live chat service on your website with Live2Support. Enable your customers to communicate with your reps and sales force live in real time. Build customer engagement, sustain customer relationships and close sales. Dating and Community Orientated Flash Audio / Video Chat Software. Audio / Video Streaming Application Development. LiveChat - live chat and help desk software to increase sales and improve customer service. Place a live chat option on your website to provide immediate assistance to your online visitors and turn them into customers. Live chat script is completely one time purchasing online software and ready to run with your websites. Multiuser live chat software helps those companies who want to expand their business online and give full technical support to their customers or clients. Start Live Chat is application for visitors tracking and live chat, help and support. Stream video right from your PC or Server! WebVideoStreamer contains flash video encoder and video streamer allows you to share video in webcam chat or live chat, create video podcasts, implement webcam surveillance and organize streaming hosting. Single operator chat script is completely web based utility so no need to download any plug-in application to chat with your customers and clients. NEW IN V4: Remote Screen Sharing inside of a chat.